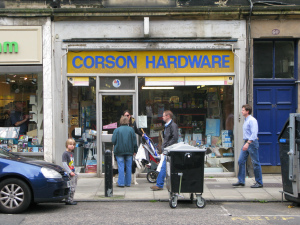 This now legendary piece was first posted 8 September 2012 on http://citythreepointzero.wordpress.com/ It describes a hardware store in Edinburgh from which I have tried to buy many things over the years, entirely without success. Since posting, I came to realise I was not alone: hundreds, perhaps thousands of people had experienced the same thing. The game took on a life of its own: see the the comments after the original post, well worth reading. After drafting the rules, I took to playing every Saturday with my son, Alex, then aged 7. He would choose the item we would attempt to purchase, and we recorded the result. Rule (7) was deployed surprisingly often, so many games ended pointless. We often – to our amazement – found other people playing the game too. I am not making this up. 1. The CUSTOMER enters shop and requests an item of hardware normally found in such a shop. Nails, screws, bolts and tools are all typical requests. Toasters, vacuum cleaners and other domestic goods are also acceptable requests. For a request successfully fulfilled by CORSON, the CUSTOMER scores 1 point. 2. CORSON cannot refuse a request for an item he has in stock at the time of play. He may however immediately refuse any request for an item not described in sufficient detail. For example: a request for ‘a nail’ may be refused on the grounds of insufficient detail. Likewise, ‘a toaster’ if it does not specify colour, design etc. 3. CORSON may also legitimately refuse a request on the grounds that the particular item requested is ‘not for sale’, although this move is permitted only once per round. 4. After a failed request, the CUSTOMER is entitled to ask for one further item. The same rules apply. 5. If after two failed requests the customer has not succeeded, he must leave the shop at once. CORSON should smile enigmatically as the CUSTOMER leaves. CORSON scores 1 point. This outcome is of itself known as a ‘Corson’. 6. The ‘ladder’ rule. CORSON may choose to climb a ladder at any point to search for requested items. If CORSON deploys the ladder and fails to find the requested item, double points (2) are awarded. If as the resort of the use of the ladder, the CUSTOMER is successful, then double points are due to the CUSTOMER. 7. The ‘early closing’ rule. CORSON always closes on Wednesday afternoons and Sundays during which time the game may not be played. At any other time, CORSON is entitled once per game to close the shop in order to prevent a sale. No points are awarded to either party in this case. 8. The ‘Parrafin’ rule. The CUSTOMER is entitled, once per game, to ask for ‘parrafin’, an item which CORSON always has in stock. ‘Parrafin’ counts as a successful sale, but no points are awarded to either player in this case. 9. How long to play. The game is played on a weekly basis, over a decade. At the end of each decade, the CUSTOMER and CORSON add up the points scored. Whoever has the largest number of points wins. At this point, players traditionally switch roles. 10. Disputes, and further information. The long duration of the game makes accurate recording of play essential. A notebook for the purpose can be purchased from many retailers in the vicinity, but, it should be stressed, NOT from CORSON himself. Attempts to buy a notebook from CORSON cannot be counted as play. Disputes over play should be directed to The Adjudicator, Board of Corson, 30 Woodburn Terrace, Edinburgh EH10. The Board meets twice per year, and considers all reasonable requests. The Adjudicator also organises an annual Corson Ladder. Entrance to the Ladder is by invitation only, determined by the Board on 1 March each year.